"Garland was the other person who influenced my work. In that sense, the way she structured a song because I never really studied that kind of thing. I studied technique for a long time, but I never studied with a coach and I began to see how her songs were structured with the beginning, middle and end that you have to pay attention to the large arc, the big arc of a song...I was with her socially several times but certainly not friendly, no. She used to sing at a little club. 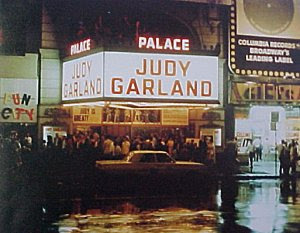 When she was a the Palace? She'd still want to sing some nights at a club, a little private club called the Gold Key Club and I knew the pianist there so whenever she was there, he'd call me to 'come, Judy's in' and I lived nearby so I'd rush over and just sit and listen to her sing to herself. It was great...We didn't have [recording] equipment like that then. I would have been recording it otherwise. Believe me!" thats unbelievable. Thanks for sharing that Sarah.